Odoi (御土居) is the ruins of the earthworks and moats constructed by Toyotomi Hideyoshi. Odoi of Kitano Tenmangu Shrine remains in a great condition. It is also known as Momiji Garden because it has a great Momiji trees that show great Koyo in Autumn. The entire moat and earthworks surrounding the city of Kyoto was about 22.5km long. Open: 9:00 to 17:00 only during Koyo season and Ume season. 1. use Kyoto Bus to Kitano Tenmangumae. Odoi was built to protect Kyoto from enemies and flooding of Kamogawa River and other rivers. It is 8m tall and 12.5m wide on the top of the hill. 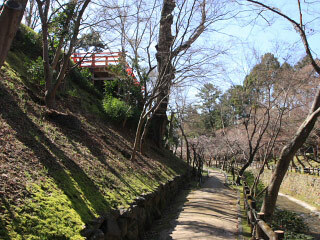 Odoi of Kitano Tenmangu is also very famous as Momiji Garden. There are about 250 Momiji, Japanese maple trees, in this garden. Some of the are 350 to 400 years old.